For purposes of the federal judicial system, Congress has divided the United States into judicial districts. There are 94 federal judicial districts, including at least one district in each state, the District of Columbia and Puerto Rico. Three territories of the United States — the Virgin Islands, Guam, and the Northern Mariana Islands — have district courts that hear federal cases, including bankruptcy cases. The breakdown of what is in each judicial district is at 28 U.S.C. §§ 81–131. Federal judicial districts have also been established in the District of Columbia and Puerto Rico. 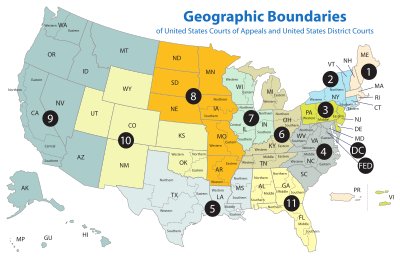 Courts in other insular areas are territorial courts under Article I of the Constitution, not United States district courts, although they have similar jurisdiction. The District of Wyoming includes all of Yellowstone National Park, including areas in Montana and Idaho. The District of Hawaii includes Midway Island, Palmyra Island, and a number of other uninhabited Pacific island possessions of the United States. Each district has its own United States district court (with a bankruptcy court under its authority), including judges, clerks, court reporters, and other support personnel, all employed by the judicial branch of the government and overseen by the Administrative Office of the Courts in Washington, D.C. There is also a United States Attorney in each district, who acts as the federal government's lawyer in the district, both prosecuting federal criminal cases and defending the government (and its employees) in civil suits against them; the U.S. Attorney is not employed by the judicial branch but by the Department of Justice, part of the executive branch. There is also a Federal Public Defender who represents people charged with federal crimes who cannot afford to hire their own lawyers; some FPDs cover more than one judicial district. Each district also has a United States Marshal who serves the court system. Below is a list of the federal judicial districts and the place(s) where each court "sits" (holds trials) in each district. ^ "District Courts". United States Courts. Retrieved 26 January 2011.